Who couldn’t use more money? Whether you only have a part-time job or your 9-to-5 simply isn’t paying you enough, you may be looking for an additional source of income. 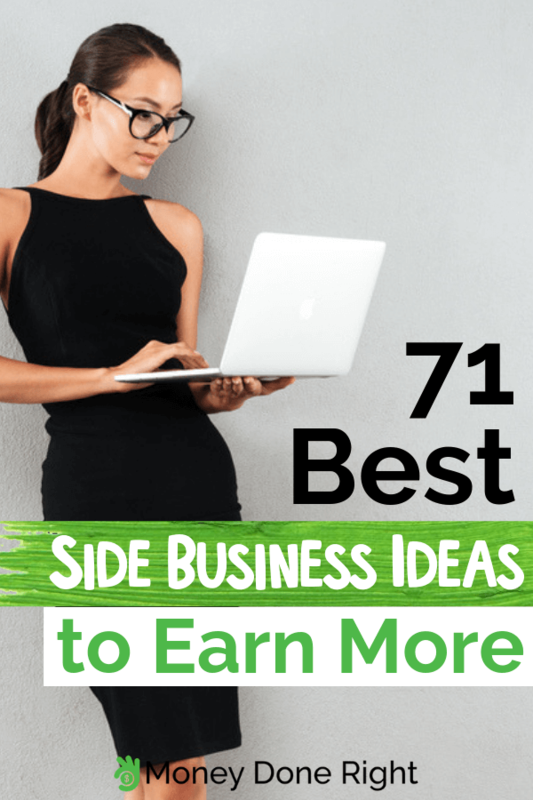 However, you may be struggling to find side business ideas that actually work. The good news is that there’s no shortage of options. In fact, we’ll present more than 70 of them here. While some jobs require training or specialized skills, others can be done with little to no investment on your part. Thanks to the Internet, there are more possibilities for a side hustle than ever before. Click here for a comprehensive list of online side business ideas to help you earn extra income. You can do them while you watch television, wait in line at the store, or travel on public transport. SurveyJunkie, Swagbucks, InboxDollars and CashCrate are some of the best options. One of our favorites is SurveyJunkie. Click here to sign up and begin earning money by sharing your opinion. If you need cash quickly, one of the easiest things you can do is sell items you own on eBay. Of course, you will run out of things eventually so you will need to go a step further to earn on a consistent basis. Why not buy items from other people and sell them for a small fee? Many people have things they want to get rid of, but they may not have the time or willingness to create the listing. Stationery, home accessories, jewelry, and artwork are just some of the things you can sell on Etsy. If you have a love for arts and craft, why not use your talents to start a side gig? You can also sell digital prints, posters or cards which people can purchase and print at home. A great side business idea is selling cosmetics. Consider joining Avon, a global network with almost six million representatives. When you sign up, you’ll be asked to pay a $15 fee and fill out a form. After that you will receive an Avon start-up kit which includes all the information you need to know about running an Avon business. During your first campaign, you will earn 50% of your sales. As long as you sell $50 worth of products in your first campaign, you’ll get that 50% earnings on your next three campaigns too. After your fourth campaign, earnings are based on your total sales. If you have graphic designs skills, this may be the perfect side hustle. Create personalized designs that can be used on clothing, drinkware, stationery, and other items. When people make a purchase on Cafepress, you earn a commission. To help you earn extra cash in your spare time, we’ve put together a list of lucrative side hustles. Check it out now! Another option for people with strong design skills is Teespring. This site focuses on printing on-demand T-shirts. If you can create attractive designs and market them well, you can make good side income. The platform is quite simple to use since you simply design the product, set a price and begin to sell. If you have healthy hair and the thought of selling it doesn’t freak you out, you should consider using it to make some profit. Your hair doesn’t have to be waist length for you to begin earning. One popular site is hairsellon.com which takes tresses over six inches long. You can use the site’s hair calculator tool to find out how much your hair is worth and if it makes sense to sell it. A great way to make and save money is Long Game Savings. The app encourages you to save money, offering you rewards in the form of coins, which you can then use to play games. If you play and win, you can earn more money, either cash or cryptocurrency. Sign up for Long game Savings using this link to get 300 bonus coins and start earning rewards for making smart financial decisions. Fulfillment by Amazon allows you to open a store and sell products without actually ever handling stock. You would be responsible for getting your items designed and shipped to Amazon. They would then be stored in Amazon’s fulfillment centers. You would sell the items, but Amazon would pack and ship them and provide customer service. If you love driving and interacting with others, why not pick up some passengers in your city? The sharing economy is showing no signs of slowing down and once you have a car, driving is a great way to start a side hustle. If you need lots of flexibility, this job is ideal since you have full control over when you work. Sign up today to become a Lyft driver and start earning side income. High on the list of side business ideas is making deliveries. If you have a driver’s license and you know your way around the city, you could be making some money. Depending on the company you work for, you may be able to deliver small packages in your own car. However, if you have a commercial driver’s license you will have access to a wider range of jobs. Amazon, UPS, and Roadie are among the companies that hire delivery drivers. Even if you don’t have a car, you can make deliveries. Postmates transports food, drinks, and retail items and you can do this by bike or even on foot. You can make yourself available when you have free time and purchase and deliver items to people near you. With HealthyWage, you can make some extra cash and get motivated to lose weight. If you know how to fix computers, don’t let your abilities go to waste. Start a side hustle by marketing your skills on social media or via posters and word of mouth. You can take in as much work as you can handle during the weekend or on your off days. Maybe you’re better at using software than fixing hardware. If you have knowledge or skills that are in demand, you can teach others online. Many online users are looking to improve their skills in areas from writing to design and accounting. You can launch your course offering independently or you can use sites like Skillshare and Udemy. A blog is a great way to start earning passive income. If you want a side hustle that makes money even when you’re not actively working, this is a good option. Affiliate marketing, advertising, and product sales can help you earn money even when you are asleep. It will take time, effort and money to get your blog traffic going but once you develop a strategy, you can earn good extra income. Click here to learn how we make $30,000+ a month blogging and how you can do it, too! If you have a blog, an e-book makes a great additional product. However, it can also be a standalone item. You can write fiction, how-to guides, cookbooks, or just about any type of content people are interested in. If you’re not a good writer, you can hire a ghostwriter to write the book for you. As an alternative, you can sell audiobooks on Audible or iTunes. If you are an expert on a topic that’s difficult to understand, why not produce an audio version? Forex trading, accounting, or investing can make good topics. Staying with technological side jobs, you may prefer to get in front of the camera. You can make extra income as a YouTuber in a range of niches. Travel, makeup, gaming, and day-in-the-life type videos are popular but you may have an even better idea. Would you rather be heard and not seen? If you have broadcasting or acting experience, consider voiceover acting when you make your list of side business ideas. Advertisements, promos, documentaries, and animated films all need voices. You can find seek out voiceover agencies, motion graphics companies or individual audio or video creators to get your foot in the door. If you’re a Facebook, Instagram, or Twitter whiz, you should try getting some clients. From restaurants and hotels to retail operations, social media management services are in demand. However, many small business owners don’t have the time to invest in it. They turn to freelancers for help. If you market your services well, you’re very likely to get some interest. To find out more about how you can make money from home as a social media manager, check out this article. Using Skype or a dedicated tutoring platform, you can impart knowledge to a variety of people. Whether you help students prepare for SATs or teach math or writing skills, you can earn money while helping others. Like many other online jobs, tutoring allows you to work from any location which is convenient. There are many people who want to learn English. Many of them may be students or workers in your city. You can teach English at night schools, community centers or in one-on-one settings. If you prefer, you can teach online instead. If you are an English language pro, you can make money tutoring others online. Click here! Instead of teaching specific subjects, you could get into coaching. You can guide entrepreneurs, busy moms, or individuals who simply need some help navigating their lives. Draw on your skill set and expertise and start a side gig which helps others get things on track. JustAnswer provides another way for you to make side income from your professional expertise. If you are knowledgeable about information technology, law, appraisals or medicine, there are people who need your input. Once your license and credentials are verified, you can sign up to take questions online or via phone. You can work at the time of day which is convenient for you. Podcasts are exploding in popularity and competition is high but if you bring a unique perspective, you can earn some money. Use them as an opportunity to share your life experiences and knowledge or invite guests who have something to offer your audience. Earn through sponsorship, advertising, affiliate marketing, membership sites or digital products. While many bloggers and podcasters use affiliate marketing as one of their income streams, you can start with the intention of building an affiliate marketing site. You will need to create high-quality content, build an audience and promote your products continually. Try to find a niche in which you can excel. Click here to find out how you can make money with Amazon’s Affiliate Program this year. Sites like Fiverr were made for people looking for side business ideas. Sign up and you’ll find people hiring freelancers to do things like write blog posts, design logos or set up email lists. You can price basic services from $5 and charge more depending on what the client requests. This means you can do lots of small jobs or take on some larger projects. Another option for selling remote freelance services is Upwork. Choose from jobs involving data entry, social media marketing, writing, software development, architecture, and more. Take the time to craft a top-notch profile and work on your pitching skills to help you land the best gigs. There’s an app for everything these days but there are still many which haven’t been created yet. Whether your interest is in gaming, publishing, finance or something else entirely, you can put your development skills to use. If you don’t think you’re ready to put an app on the market yet, upgrade your skills then get into the field. Need to make money fast this year? Click here to find out exactly what to do. If you used to play around with developing websites but you never took it seriously, now is the time to get back in the game. Both companies and individuals need a web presence these days but many people don’t have the skills or time to create their own websites. Start a side hustle making mobile-friendly, aesthetically pleasing websites for small businesses and make some extra money each month. Some visitors to your city or town probably want to have a local experience. Why not rent out your spare room or rooms on Airbnb? Once it’s legal in your area or building, this is one of the best side business ideas. If you can deliver an excellent experience, you shouldn’t find it hard to make money. If you’re ready to list your space on Airbnb to start making extra money, sign up by clicking here! Amazon Mechanical Turk allows individuals and businesses to outsource a variety of tasks including research, content moderation, and survey participation. Since these tasks are small, you can do a few in your spare time and scale up when you have more time. United States-based workers can transfer their earning to their Amazon Payments account or to an Amazon.com gift card. Many people want to eat healthier meals, but they may not have the time to prepare them. If you know your way around the kitchen and you know basic nutrition, why not prepare weekly meals for busy families? You can dice and slice ingredients, marinade meats, and deliver them to clients at the start of the week. Some companies are always on the lookout for mystery shoppers. Your role would be to pose as a regular customer and document your experience for management. Some retailers require you to do this in person while others want you to document your online experience. You can look online for companies who are hiring or just approach some retailers and ask if they would want you to do this. Relatives will likely want you to have a nursing background or some experience in a senior citizens’ home. If you have this, you can use some of your spare time to take care of older people. You may be responsible for assisting them with personal hygiene, meal preparation, and taking medication. More independent seniors may mainly want someone to talk to. Check out this article for a lot more ideas and suggestions on how to earn passive income in 2019. If you’d rather get some fresh air while you work on your side hustle, walking dogs is a good idea. You don’t need any special skills so this is one of those jobs you can start doing almost immediately. It helps if you live in a neighborhood with lots of dogs since you can simply ask around or hand out flyers. It should then be pretty easy to build up a clientele. Do you know how to make pets look their best? If you have the room in your home or a van you can use for visits, pet grooming is a viable choice for a side gig. You’ll have to make an initial investment in tools and equipment, but you shouldn’t encounter any major difficulties in getting your business off the ground. Many pet owners like to leave their fur babies in capable hands when they travel. This means there are opportunities for people like you to start a side hustle taking care of pets. You will have to feed and walk the animals and ensure they are occupied or entertained. The owners may bring the animals to your home or ask you to stay in theirs. Rover and Sittercity are two of the sites you can use to find jobs. If you’d rather take care of children, return to the babysitting days of your teenage years. The money may not seem like much now but if you get a few steady clients, you can earn enough to pay a few bills. Brush up on your first aid skills to give you an extra edge when you pitch your services to parents. Looking for more ways to make money but aren’t sure which one is a good fit for you? Check out our detailed list of money-making ideas. Fancy staying in some nice digs while the owners are away? Some people don’t like leaving their homes unattended when they travel so they ask someone else to stay there. If you are of good character and have no criminal background, you can apply for housesitting jobs. You may be required to water plants, keep the house clean and receive packages or mail, among other duties. If you have lots of free time, you can simultaneously take on one of the other jobs listed here. Start a side hustle in a simple way by renting out your car. This is ideal if you don’t use your vehicle as much anymore. Maybe you work from home and you don’t need your vehicle during the day. Turo lets you set your price and rent your car to visitors who don’t want to rent from big agencies. You will have even more success if your car is unique. Click here to sign up for Turo and begin making money by renting out your car. This is a good gig for people who don’t mind cleaning and enjoy having everything in its proper place. Your duties will vary depending on what families or individuals want but they can include doing laundry, making beds, and general cleaning. If you have a couple days free per week, you should be able to take on at least two clients. You can’t necessarily predict when paid focus groups will be happening but if you are a college student, you’re well-placed to find them. You may also get lucky if you live near a university, college, or research institution. The pay varies but you can make a tidy sum when a large company is conducting the research. Believe it or not, there are people out there who are willing to pay for someone to spend time with them. It’s not as creepy as it sounds. People use rentafriend.com to find “friends” to attend social events with them, go sightseeing, or even just talk on the phone. If you love meeting new people and you’re not averse to trying something different, this job could pay off in more ways than one. Apparel is one of the leading categories of consumer goods and people are always looking for something new to wear. If you have some time on your hands and you want to earn some more money, consider making and selling clothing. Sign up for a course if your skills aren’t yet up to par. If you don’t want to make clothing from scratch but you have some knowledge of garment construction, alterations may be just the thing for you. Many items don’t fit well straight off the rack so you’ll be earning an income while helping people to look their best. Let your family and friends know about your new service and get them to help you spread the word. Check out these 100+ ways of making extra money to find the best options for you. Are you a genius when it comes to perfecting complexions, highlighting, and contouring? If so, you can moonlight as a makeup artist. It doesn’t matter whether you’ve been to beauty school or you’re self-taught as long as you can do the job. You can choose whether you want to do editorial work or focus on weddings or casual makeovers. If you’d like to offer another type of personal care service, maybe you’d enjoy doing manicures and pedicures. You will need some training, but this is easily accessible. If you get a part-time job in an established nail studio, you won’t have to worry too much about attracting your own clientele. Soaps, lotions, and body scrubs are always in demand and they are relatively easy to make. Include this among your side business ideas if you like manufacturing products and experimenting. You can market your first few batches among your family and friends before you take your products to market. Check out the top three ways to make money from home in 2019. For a job that requires little investment, consider washing cars. You can advertise your services in any way you wish but you may want to pitch to businesses which have lots of employees. Maybe you can visit the businesses weekly to wash and detail workers’ vehicles. Depending on where you live, this may just be a summer hustle but, in some states, you will find work year-round. If you live in a community with lots of pools or near a resort or apartment complex, start by asking the owners if they need help with pool cleaning. You (or your mom) probably baked cakes and pastries all the time to for school bake sales. You may want to return to this as a side gig. As long as you have the skills, it’s a great way to make extra cash in the evenings or on the weekend. If you want to go into a niche area, consider gluten-free or sugar-free treats. Do you have great organizational skills? Do you really enjoy throwing parties? If so, your next side hustle may be an event planning business. You can decide whether you want to focus on children’s parties, conferences or a variety of events. If all you want to be responsible for is the music, why not DJ on the weekends or after hours? If you know all the hits and you can read a crowd, you’ll be able to get some gigs. You can start by looking at small community venues or events hosted by people you know. If you live in an urban area with lots of wealth, becoming a personal shopper can be quite lucrative. You may be responsible for tracking down specific things a client wants, making suggestions and giving advice. Previous experience in retail is usually an advantage. Buying and selling cars can be a good side hustle. However, you need to be a skilled negotiator with good knowledge of the market and an affinity for sales. You will have to buy the vehicles for less than you will sell them for, so you need to be quite savvy. If you have a clean driving record and enjoy teaching, you should get your driving instructor license. Teaching driving lessons is quite a flexible way of earning income. As you list the side business ideas you want to pursue, you should consider this. Lovers of history and culture will enjoy this. If you live in a touristy area, you may want to offer walking tours, either on your own or by joining a company like Free Tours by Foot or Strawberry Tours. Alternatively, you can work at an attraction or museum. Schools and community groups are often looking for coaches. If you enjoy sports and being active, this may be the perfect side job. It’s fun and you’ll earn some extra money. If you have human resources experience or you’re just really good at writing effective resumes, why not offer it as a service? You can offer resume writing services or evaluate resumes and tell job seekers how to improve their documents. Do a few for free or reduced cost, get some reviews and get your business off the ground. There is a huge demand for writers, especially online. Business and brands need people to write blog posts, e-books, social media posts, emails and more. If you can write web content, scripts or marketing copy, you’ll be able to find good gigs. Click here now to learn how to get paid to write online articles. If you’d rather sniff out important news stories and report on them, get started with freelance journalism. Newspapers, magazines, and news websites want exclusive, hard-hitting stories. If you have access to credible sources and good instincts, pursue some stories and pitch them to editors. Someone has to edit all the content produced by freelance writers and journalists. If you can spot typos, improve others’ writing, and follow a style guide, look for some proofreading opportunities. Some projects will have flexible timelines so you can work at times which best suit you. You can ask people around your neighborhood if they need help or you can use a site like TaskRabbit. You can help individuals pack and move, clean their house, or do yard work. Assembling furniture or carrying out minor repairs are also options. Open a store selling whatever types of products you want without ever seeing the stock. This is basically what dropshipping is and it is one of the side business ideas which are growing in popularity. You sell the products from your storefront, but a third party fulfills the order. If you’d like to know more about how to start a dropshipping business and how it works, check out this article. Photography can be quite lucrative and this makes it a great side hustle. You will need to invest in equipment but if your work is good, the cameras, lights, and lenses will soon pay for themselves. Experiment a bit to determine your style and decide on a niche. This may not be the most exciting side job, but it can earn you some cash just the same. A notary public is an officer who, under the law, can administer oaths, witness signatures, take affidavits and more, depending on the jurisdiction. You will need to undergo training, pass an exam and pass a background check before you can be appointed. Many business executives prefer to outsource their administrative tasks. They may need someone to respond to emails, set up appointments, book travel, or post to social media. Some may also need you to do research or prepare reports. The duties can vary widely between clients so you can find jobs which align with your skills. If you’re skilled with arranging décor, lighting, and furniture, you can help homeowners to execute their vision. Unlike interior designers who need a bachelor’s degree, decorators are only required to have experience or post-secondary education in interior decorating from an approved school. You will need to be proficient with computer-aided design software. There are many ways to earn passive income. We’ve rounded up some of the best in this article – check it out now! Create your own branded line of products and have them manufactured by someone else. This is the perfect side gig for someone who enjoys retail but doesn’t want to be hands-on with manufacturing. You can specify everything about the product, and have it formulated and delivered to you. Private labeling is available for food, cosmetics, and everything in between. Help small businesses get their books in order or prepare for tax season. If you have an accounting background or even if you’re currently practicing, you should consider making this your side hustle. It is certainly an area in which many business people need assistance. If you can do something well, chances are there is someone willing to learn from you. Think about your skill set and see what you can offer. Whether it is yoga, sewing, music, writing or dance, you can earn an income from it. You’ll likely need to already have a sizeable following if you want to include this among your side business ideas. If you have a large social media following or you’re an influencer in some way, reach out to brands whose values align with yours. Show them why they should hire you to represent their brand. Looking for even more ways to make extra money? Check out our article for 100+ tips! What are some of your favorite side business ideas that actually work? We’d love to hear your thoughts, so please share them in a comment below!